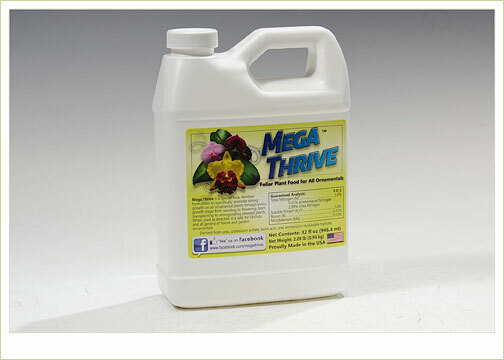 Introducing Mega Thrive - a specially designed liquid formula that will optimize your plant's growth. Mega Thrive contains an enzymatic formula which internally stimulates the plant's own natural production of hormones (auxions/cytokinin-like substances) resulting in the "Mega Thrive" effect. More and bigger leaves. More roots. More flowers. More vigor! Sorry, this item can only ship to the continental US. Without getting too technical, Mega Thrive is designed to supplement the nutritional requirements and bioactivities with auxin and cytokinin-like plant stimulants (natural plant hormones and phytohormones) which increases the physiological functions of a plant, like leaf expansion, prolific root formation, more root hairs, promotion of young shoots and stronger leaves, and increasing photosynthesis which produces more carbohydrates. Mega Thrive allows the plant to better utilize essential nutrients like nitrogen and phosphorus. From root tip to leaf tim and all the way to the flower, Mega Thrive maximizes your plants' growth. Mega Thrive is a plant supplement. It must be used in conjunction (but separately) with your regular orchid fertilizer feeding. Do not mix Mega Thrive together with other plant food. Mega Thrive can be used year-round by applying twice a month as a foliar spray.